If you need to format a book that contains a table, chart, graph, etc., into an ebook, you may wish to change the table into an image. 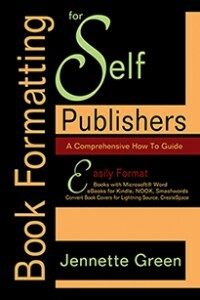 Certain platforms, such as Kindle, will convert some of these elements correctly, but other self publishing ebooks platforms do not. All self publishing distributors, however, accept images within a document. Therefore, if you’d like your graph (etc.) to look just as it does in your Microsoft Word or print document, you may want to convert it into an image. •	If your table (or other graphic element) is in a Microsoft Word document, print the page to PDF. If you are unable to save one page as a PDF, save the entire document as a PDF. •	If your table is in a multiple page PDF, note which page it is on. •	Open an image software program, such as Photoshop or Gimp, that will allow you to open a PDF file. As you open the PDF file, choose the following settings, if available: 1) specify which page you would like to open, 2) the dpi you would like your final image to be, and 3) if available, choose the color space (RGB or CMYK) that you would like your final image to be. •	Using the crop tool, crop the table from the page. If needed, adjust the image resolution and resize the image. Save the table image as a JPG file. •	Insert the image into your Microsoft Word .doc. This entry was posted in Book Formatting, Format a Book, Format eBooks and tagged Images, self publishing ebooks. Bookmark the permalink.